Self-harm often arises at moments of despair or emotional intensity, and its reasons are not necessarily available to the conscious mind. Managing Self-Harm explores the meaning and impact of self-harm, and the sense in which it is a language of the body. It is designed to help clinicians, people who self-harm and their families and carers to understand its causes, meaning and treatment. 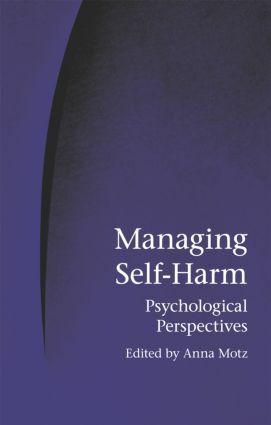 Each chapter integrates theory with clinical illustration, enabling the direct experiences of those who self-harm to be heard and reflecting the populations that are most likely to self-harm. The contributors are drawn from a wide range of backgrounds, including clinical psychology, psychotherapy, group analysis and psychiatric nursing. This book does not offer a prescription for self-harm cessation but rather describes therapeutic approaches to working with self-harm, and outlines the complex, subtle and meaningful interactions between those who engage in self-harm and those who seek to understand it. With a specialist interest in women’s self-harm, Managing Self-Harm will be essential reading for all mental health professionals, including clinical psychologists, psychotherapists, psychiatrists, psychiatric nurses and social workers.